It is critical to record and report information about volunteer service, yet organizations rarely see what is significant about volunteers. Get some tips modeled after July 4th fireworks in the U.S. and capture attention with great reports that POP! Read this month's Hot Topic. Tired of pesky Internet browser settings that require you to download PDF files before viewing them? We are! So, we've added an immediate quick view of each table of contents (if one exists) on a book's product page. Simply look for the "Table of Contents" tab under the book's image. For a closer inspection, you can open the image in a new browser tab/window or still download the PDF file. A completely new feature in the bookstore is a list of where all versions of our books are found. Prefer to read our books as a Kindle or ePub/Nook? Looking for availabilit y of a title in a country other than the U.S.? Click on the "Other Editions" tab on every book's description page for direct links to the suppliers. Please note that many of our older books may not be available in Kindle or ePub, but almost all of our books come in PDF for immediate download directly from our own online bookstore. We also know that some of you prefer to read books on paper. As always, all books published by Energize and a few other titles are offered in our store both electronically and in print, but we usually only sell the PDF editions of books produced by other publishers. Now, in this "Other Editions" section, we also provide links to the paperback editions of those books, when available elsewhere (in the U.S. and other countries). It has been many years since the United States has had a national conference designed specifically for the many people who specialize in volunteer management - those who have been designated to lead their organizations' volunteer engagement strategy in any type of setting. Some excellent conferences occur at the state level - and in other countries - but we have sorely missed the type of gathering once run annually by the former Association for Volunteer Administration. 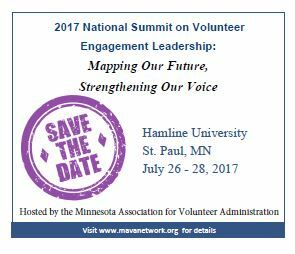 To the rescue comes the Minnesota Association for Volunteer Administration (MAVA) which, after deliberation and the involvement of a large steering committee of both Minnesotans and national leaders in the field, is hosting the 2017 National Summit on Volunteer Engagement Leadership, with the theme: Mapping Our Future, Strengthening Our Voice. More details will be announced over the next months, but right now mark your calendar for July 25-28, 2017 (great weather in Minnesota at that time of year!). To get on the event's notification list for continuing updates and news, complete the short interest form on the site now. No obligation, but it will assure that you get information about submitting workshop proposals, major speakers, early bird registration, and more. Volume XVI, Issue 3 of e-Volunteerism, our international, subscription-based journal, continues through July 15th when the next issue launches. As always, all previous journal issues are available to subscribers online in the in the Archives. A World of Volunteering by Global Corporations (Vol. XIV, 2, Jan. 2014) - In this Along the Web article, Arnie Wickens focuses on the glossy Web sites of various global corporations to see what they reveal about their volunteer or service program, offering useful information for those considering recruiting new volunteers from major employers worldwide. Missing the Point: Asking the Wrong Questions in Volunteering Research - Rob Jackson and Susan J. Ellis take issue with recent research on volunteering and argue that asking the wrong questions will ensure the wrong answers. They review troublesome assumptions in a published UK research report and, before long, are in full rant mode: Do we need more volunteers? Stop studying volunteer motivation, please! - Lyn Stack explains how Barwon Health regional health services in Australia implemented a Volunteer Training and Development program that provided its 1,000 volunteers with opportunities to expand their healthcare knowledge, participate more concretely in the health services' mission, and ultimately build an empowered, healthy, and sustainable volunteer base for the future. - Laurie Mook reviews the research of Walden University's Dr. Tonya Renee' Howard who interviewed five generations of volunteers and asked about their volunteer experiences and proposes generation-based volunteer management practices that all leaders of volunteers will find useful. - Erick C. Lear explores formal types of volunteering that aid victims of crime and uncovers Web sites that offer training resources on this subject for others doing related work. Volume XVI, Issue 4 is in production and offers some great articles, including: a Points of View about re-focusing national "Volunteer Weeks" to accomplish more; how the New York Central Park Zoo changed the way it trains its volunteer docents so that they ask questions and encourage visitor observations rather than lecturing on animal facts; a review of Volunteer Canada's 2013 Volunteer Recognition Study; a Training Design that explains Adobe Captivate 7; and much more. You can subscribe to e-Volunteerism for a full year or for 48-hour access. Note that subscribers have full access to the Archives of all 15 previous volume years. It seems fair to assume that 99% of North Americans know about and most even like McDonald's restaurants. Yet for most of my adult life, I cannot remember a single day in which I have not heard or seen at least one commercial for McDonald's. What does this have to do with volunteer recruitment? Well, if McDonald's feels that I have to be reminded, day after day, commercial by commercial, to consider buying its hamburgers, maybe (just maybe) local volunteer projects need to put out messages about available volunteer opportunities more than once in a blue moon! Never assume "everyone knows" about you, even if you represent a traditional and well-known community organization. And if you represent an organization that is less recognized to start with, it is even more foolhardy to think that occasional publicity and periodic recruitment messages are enough contact to make people remember you. If you gave a speech to a civic club last spring, what can you do to remind them about you this fall? If you registered your agency with the local community college student volunteer office when they sent you their questionnaire last summer, can you revitalize that contact before the students leave for winter break? Are you certain that the bulletin board notice you placed in the senior center last month is still up? Dozens, maybe even hundreds, of notices, announcements, and invitations bombard people all the time. This is true at home, at the work place, and online. Some is what we call junk mail or spam, but much is valid and even appealing information - - all hoping for some action from the recipient/listener/reader. Is your message about volunteering competitive...and memorable? The constant change of social media. One reason why people are glued to their cell phones is that messages flash by constantly and fade away just as quickly - especially on platforms such as Facebook and Twitter. Social media has no sense of history and it's almost impossible to find posts from yesterday, let alone a month ago. If you find social media works for your recruiting messages, plan to post at least daily while a volunteer role is waiting to be filled. Many organizations are seeking volunteers and most are worthy causes. What makes your message about openings in your setting more memorable or appealing? At least keep yourself in front of prospective applicants. In order to recruit someone as a volunteer, the opportunity has to be a match not only between your organization's and the person's skills or interests, but also with his or her availability. If your recruitment message arrives at a bad time for the individual, the answer -- at that moment -- will have to be "no." But had your message been delivered six months earlier or a year later, that same candidate may well have become an active volunteer. Repetition of the invitation acknowledges the importance of timing. We live in a mobile society. The people who heard your presentation two years ago are probably no longer members of that group and have been replaced by new folks who never heard your presentation. Agencies stay the same but personnel move around. So even when we think we are speaking to old friends, we end up finding new ones. This applies to any outreach effort, including volunteer recruitment. The general value of repetition. Advertising experts are fond of saying that they know one-half of all advertising dollars are wasted; now, if they only knew which half ...! Another advertising truism is that it takes multiple contacts to make an impact. Sure some people respond immediately to the first ad, but most people are only subliminally aware of the first message sent. Only after repetition will someone be moved to action. Repetition also implies credibility and stability, in that multiple messages reflect the staying power of a product (in this case, your organization). It isn't "fly-by-night"; it has continuity over time. Maintaining a steady flow of recruitment messages throughout the year makes sense on every level. It also recognizes that no one recruitment strategy alone will be enough to fill all your needs. But the cumulative effect of consistent outreach should produce a steady flow of applicants because you have sown so many seeds in so many ways. Veteran recruiters will tell stories of new volunteers coming in with flyers that were distributed long ago, often to a friend or relative who passed them along a circuitous path until they reached the candidate calling you today. Did you know we have created copyright-free graphics to use as you wish in motivating volunteers? Visit our Pinterest page to see this board and more images we collect for you.